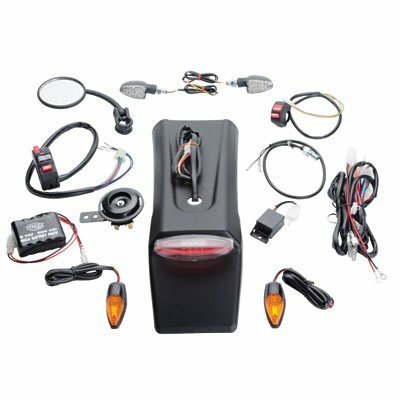 The Tusk Motorcycle Enduro Lighting Kit is designed to be a simple way to provide front and rear turn signals, tail/brake lights, horn, and rearview mirror for your motorcycle. The Tusk Motorcycle Enduro Lighting Kit is easy to install and does not require cutting into or messing with your motorcycle�s existing wiring. The components have universal applications and will work on almost any motorcycle with minor modifications. The kit is intended for motorcycles with existing headlights.